Sampo Haapamäki has been employing quarter-tones in his music for more than a decade. In his new work, to be performed at the Time of Music festival in Viitasaari, he combines a large chamber ensemble and electronics. When Sampo Haapamäki (b. 1979) talks about his music, the listener is bombarded with mind-boggling terminology – ‘live electronics module’, ‘motion-sensor technology’, ‘spectral frequencies’, ‘quarter-tone resolution’, ‘micro-time signatures’, and so on. But not to worry: listening to Haapamäki’s music banishes thoughts of such theoretical considerations. It is quite simply intense and dramaturgically captivating. Haapamäki’s recent output can be heard at the Time of Music festival in Viitasaari, where a work jointly commissioned by the festival and IRCAM is to be premiered on 5 July. Titled IDEA, it is written for an ensemble of 11 musicians and electronics. It will be performed by the highly appreciated International Contemporary Ensemble from the USA, conducted by Swedish conductor Christian Karlsen. Haapamäki grew up in the municipality of Toholampi in Central Ostrobothnia. His pathway to becoming a musician progressed from instrumental experiments and piano improvisations in adolescence towards a creative approach. “When I was in upper secondary school, I improvised intensely on the piano every day, and gradually these improvisations took on a compositional approach. My first actual compositions were written for piano. I was inspired to make my own music by the example of composers Veli-Matti Puumala, who was born in neighbouring Kaustinen, Pehr Henrik Nordgren, who lived most of his life in Kaustinen, and Osmo Jämsä in my native Toholampi,” says Haapamäki. Having graduated from the music upper secondary school in Kaustinen, Haapamäki was admitted to the Sibelius Academy, were he studied with Tapio Nevanlinna and Veli-Matti Puumala. Haapamäki graduated with a Master of Music degree in 2005 and went on to study abroad for no fewer than eight years, becoming familiar with New York, Leipzig and Paris. He focused on various things during these studies, rounding out his composer profile. In Leipzig, for instance, he studied with Claus-Steffen Mahnkopf, a proponent of the New Complexity style, and became acquainted with micro-time signatures, among other things. At IRCAM in Paris, he focused on electronic music, and in New York he studied with Tristan Murail, one of the key developers of spectral music. Sampo Haapamäki. Photo: Saara Vuorjoki / Music Finland. 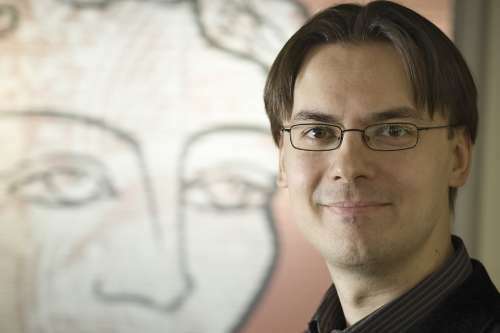 Haapamäki made his breakthrough with the energetic virtuoso work Signature (2003) for chamber orchestra, receiving both the Gaudeamus Prize and the ISCM–Cash Young Composer Award. Soon after this, Haapamäki adopted quarter-tones in his work, meaning that he began to use a scale where the octave is divided into 24 steps rather than the conventional 12. This lends his music a fascinating timbre of its own. His first work in this idiom was Haljennut [Split] (2004), and he has never looked back; all of his works since then, including the work now to be premiere in Viitasaari, employ quarter-tones. Most of Haapamäki’s works are performable on conventional instruments, quarter-tones notwithstanding, although it can be a challenge. “Orchestral musicians have been wonderful about tackling the challenges of playing quarter-tones. I have great respect for the independent practice that they put in and appreciate that it can take time to come to grips with this idiom,” says Haapamäki. In some cases, his music required the construction of entirely new instruments. To date, these include the quarter-tone accordion of Veli Kujala, the quarter-tone guitar of Juuso Nieminen and the quarter-tone piano of Elisa Järvi. Haapamäki was involved in the development process of the instruments and has used them as solo instruments in concertos. Haapamäki is by no means the only composer to use quarter-tones. In early autumn 2014, an ensemble of seven musicians playing quarter-tone instruments was formed, MikroEnsemble, and Haapamäki intends to write a new composition for them. Other publicised future projects include an orchestral work for the Helsinki Philharmonic Orchestra in 2022. (See also Haapamäki’s column about his work). Because electronics plays a prominent role in the work, Haapamäki spent a fair amount of time at IRCAM, formally the Institute de Recherche et Coordination Acoustique/Musique, one of the foremost centres of excellence in the field. “It is wonderful that I had the opportunity to work with Serge Lemouton at IRCAM studios on six occasions for a total of nine weeks. The first studio period was in July 2017 and the last in June 2018,” says Haapamäki. Serge Lemouton, Haapamäki’s principal collaborator at IRCAM, is a computer music designer who has been at IRCAM for 25 years and has worked on more than 50 projects with various composers. The work in question is extensive, clocking in at 25 minutes. What exactly is the role of electronics? A tiny sensor (R-IoT) will be attached to the conductor’s hand – or baton – to follow his movements. The movement data is fed into a computer (Max/MSP, Antescofo), which deduces where in the score the conductor is. Generally speaking, Haapamäki sees the use of electronics as involving both opportunities and challenges. “Electronics enables a vast landscape of microintervals, because on a computer you can create things for example to a hertz and millisecond precision. But electronics has its challenges. Computers are very good at calculating algorithms, but creating an illusion of living sound is much harder. On the other hand, while a live musician is traditionally considered to seek a sensitive and feeling performance naturally, the human body has its own limitations. Featured picture: The title and the three movements of Sampo Haapamäki’s new work. This article was jointly commissioned by the FMQ and Rondo magazine. See also an interview with Johan Tallgren, artistic director of the Time of Music festival, published by Music Finland.